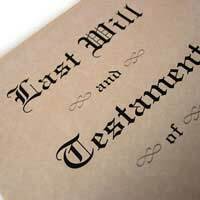 Wills are a wonderful tool for the genealogist. They can tell so much about the way a person lived, what he acquired, and his relationships with members of his family. Before 1858, wills had to be proved by the church (the Church of England and before that the Catholic Church). After that, the state took over the right of probate. It's not always necessary to have wills proved, but if the executors wish it, they arrange for it to be done in one of the two dozen district probate registries situated around England and Wales, or possibly through a subsidiary office. Once that process is complete (and it doesn't have to be undertaken in the area where the person died), a second copy of the will is sent to the Principal Registry of Family Division, which has all the wills proved in England and Wales since 1858. However, because of space constraints, the district probate registries are removing many wills more than 50 years old, although where they'll be stored remains somewhat up in the air. If you need to find one, contact the local office and ask where it might be (you can, alternatively, go to London and search in the Principal Registry). Before 1940, registered copies were made of all wills, and handwritten into volumes that were separately indexed. You can find these in the country records office, or, for Wales, in the National Library. It's simple to discover the existence of a will. Every district probate office has an index of all wills proved in England and Wales since 1858, arranged alphabetically by year. The index lists the name, address and date of death of the testator, the date of probate, the names of the executors or administrators of the estate, its value, and the name of the office where it was proved. A will can be proved anywhere between a week and six months after the death, so that the will might be indexed in the calendar year following the death. In some cases, where wills are contested, the proceedings could mean it's not proved for several years. Once you access these indexes or calendars as they're known, you can search quite easily for an individual or family. You can copy the index, or, if the will is still in the office, ask to see it. You can make notes, but not take a copy. It's worthwhile looking at the wills of other relatives, too. You can also order copies of the wills direct from the Principal Registry once you've located them in the index. If you can't find a will, then it might not have been proved. The indexes aren't perfect - name changes might not always be listed, for example, or surnames can be misspelt. But if you're searching fruitlessly in the period 1858-1870 there might be a reason. If the deceased die intestate, or the will was invalid (also if all the executors renounced their roles), then the probate court could issue a grant of administration. Since 1870 these letters of administration have been indexed with the wills, but before that they were put into separate volumes. Granted, the occasions are relatively few and far between, and the search might not even prove worthwhile, since all you're likely to learn is the place and date of death and the deceased's occupation - barely worth the effort unless you absolutely, utterly need the date of death.